Starting with beauty, I recently ran out of my absolute favourite perfume in the world, Escentric Molecules Molecule 01, so naturally snapped up another bottle. This stuff is literally amazing. I posted a review (here) a little while ago after discovering it in my Liberty London Beauty Advent 2014 Calendar and I've been hooked ever since. It's such a beautiful scent. I was very generously given a Boots gift voucher for Christmas, and one thing I'd had my eye on for a very long time was the Clarins The Essentials Eye Makeup Palette. Made up of ten matte, satin and iridescent shadows, it was one I knew I would get a lot of use out of. Like all Clarins products (check out my review of THE best mascara you will ever try), it doesn't disappoint. The lovely people at Melvita kindly sent over a bottle of their L'Or Bio Extraodinary Oil* which smells absolutely divine and is the perfect post-addition to a long soak in the bath. A combination of five rare and precious oils, the product both nourishes and protects the skin whilst giving a beautiful, subtle glow (you can even use it on your hair, too). Expect to see it popping up again on the blog very soon as I.am.in.love. If you're a regular reader of my blog then you'll already know of my obsession with Pixi (click here to read my various posts). Yet again, the brand has ticked all the boxes with their recent launches, so it's only right that I spill the details. The Natural Contour Kit* and Endless Silky Eye Pen Quartette* were both a part of the 2015 Holiday Collection however can still be found on the website. The palette is made up of four shades for the face and eight for the eyes, and, like the other powders from the brand are up there as some of my favourites (think lost lasting and totally buildable). The same also has to be said for the Mesmerizing Mineral Palettes* which are perfect if you're wanting to add a little colour to your look. 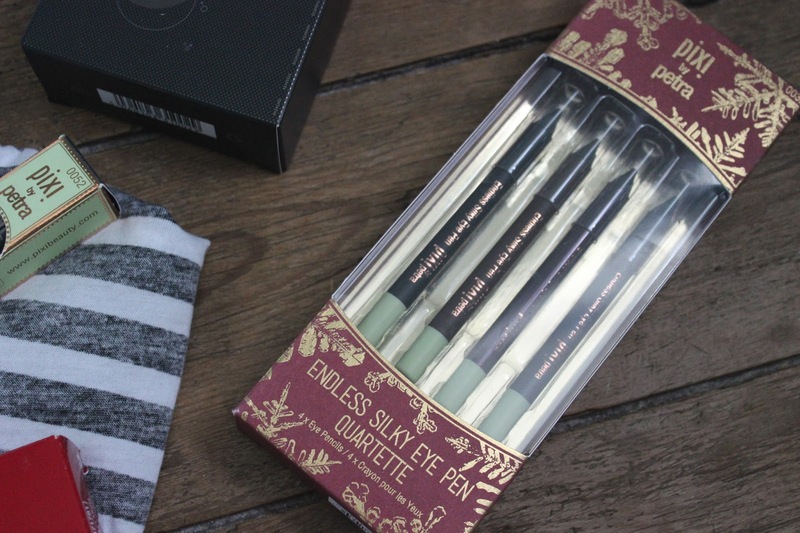 Though both are totally swoon-worthy, I think the standout for me would have to be the Endless Silky Eye Pens*. I now have several in my stash and for a good reason. If waterproof, long-wearing pencils with a gel formula are up your street then you will adore these. Not only do they come in a great range of shades, but they are seriously pigmented and something I find myself reaching for on an almost daily basis. Pixi are now also stocked in Marks and Spencer so I would definitely go have a peek at the range if you're near a store! Regal Rose is a brand I've religiously swooned over for years now. Their products are so unique and well made, and the Cartilage Claw Earrings are no exception. They're definitely not to everyone's taste, but I literally think they are the coolest things since sliced bread. Speaking of jewellery, if you're in the market for some new pieces then I would highly recommend checking out what Nikki Stark has to offer. I am a huge ring person, so the Sally Sterling Silver Ring* and Rocking Wishbone 9ct Rose Gold Ring* are both (unsurprisingly) getting a lot of wear. I generally stick to silver when it comes to jewellery as I'm pretty pale, however from talking to Nikki, she felt 9ct rose gold would be very flattering for my complexion - and she wasn't wrong! Both rings are so unique and delicate and as you can see, made to an amazing standard. I have a post coming up discussing my favourite go-to jewellery to if you want to see these in action then be sure to keep checking back! Cheap Monday also happened to be having a very generous sale around the Christmas period, so I may have purchased a couple of things... As if I don't already own enough dark clothing in my wardrobe, I ordered the Enfold Top in Punk Black. Now it might just look like a boring everyday tshirt, but the slit at the back gives it a little somethin' somethin'. Next up, the COM LS Inside Stripe Tee (no longer online in the grey) which has quickly become a (seriously comfy) staple in my wardrobe. Moving on to lifestyle, this year I'm determined to crank it up a notch when it comes to organisation, so what better way to do this than by owning 5,000 diaries and notepads? Ok, so maybe not, but all good planning starts with a nice Moleskin Diary. Even better, Waterstones had a snazzy 50% off all planners making it a very reasonable £6.95. Winning. Now this is one serious idea. Crafted by Stephanie of blog, Coco Chic, The Blogger Journal is not only pretty to look at, but crammed with ideas, tips and a trusty planner to keep your blog on track. Essentially, it's what every blogger needs in their life and I can't wait to put it to good use. Last but not least (you're looking right at it), it's my brand spanking new blog layout. After around seven months of my last design, I decided to switch things up in line with the new year. Without hesitation I went straight back to the amazing Eve who is a total diamond - I couldn't recommend her enough! I'm so pleased with the final result and think it looks rather pretty if I do say so myself - I hope you think so too! Have you been shopping for anything nice recently? Do you like the look of any of my purchases? I'd love to know your thoughts on my new blog layout!